When did shooting cops become OK? Where’s the outrage when police officers are targeted for murder? Where are the protests? Those are the opening lines of a new San Jose Police Officers Union YouTube video stating that 56 police officers in the United States have been shot to death so far in 2016, marking a 70 percent rise in such killings over the same period in 2015. “We know that we could not come home at the end of the night, but the violence we’re seeing almost daily is ambush-style killings for no reason, just for wearing the uniform and having the badge,” union president Paul Kelly told NBC Bay Area. 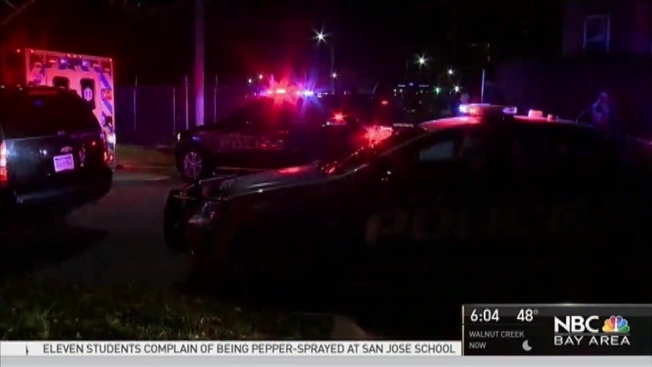 The video was released about a week after two San Jose police officers were shot at, but not injured, in East San Jose. That shooting is shown in spliced news footage in the union video referencing the Nov. 13 attack where an alleged gang member shot at two gang-enforcement officers at close range. The suspected shooter was arrested four days later. On the same day in Stanislaus County, Sheriff’s Deputy Dennis Wallace was killed by an auto-theft suspect in Hughson, a city about 10 miles southeast of Modesto. Across the country in Detroit, a police officer was shot in the head in Detroit when he stopped a man near a university campus there. And on Sunday in Texas, a San Antonio police officer was shot in his patrol car as he was writing a traffic ticket. The video fades out with the message “The San Jose Police Officers’ Association believes” followed by the oft-recited slogans “All Lives Matter” and “Blue Lives Matter,” which are controversial slogans as many activists in the country have been taking to the streets to decry that “Black Lives Matter” for the last couple years. The police video makes no mention of the Black Lives Matter movement, which was born in the wake of African-American men being killed by police officers across the country. And Kelly did not want to address this topic in an interview. The head of the Silicon Valley NAACP called the video a betrayal to a supportive community. "Very upset, disappointed, saddened that they just blatantly said they have no relationship with our community," Rev. Jethroe Moore II of the Silicon Valley NAACP said. "There's no more trust with the POA." Nikki Johnson, widow of fallen San Jose officer Michael Johnson, said the holidays are a painful time for her family. She hopes the video ad will ultimately lead to productive talks. "The hurt and pain is on both ends and I think there's things that we can do as educated citizens to not label people," Nikki Johnson said. "Or to judge or make those assumptions." The NAACP and other gruops plan to meet Sunday to discuss an official response to the POA ad. Last year, the Washington Post studied how many people are killed by police each year and found that African Americans account for 24 percent of those fatally shot and killed by the police despite being just 13 percent of the U.S. population. That means black Americans are 2.5 times as likely as white Americans to be shot and killed by police officers, the Post found.